This knife concept evolved from a knife used in trench warfare in WWI. Although the construction isn't as sturdy as that combat knife, the same rules apply -- and this particular model has held up to rough tests successfully. The combination grip and knuckle-guard is cast around the blade, not mechanically fastened to it. There should be no chance of the handle coming loose, although the knife could be damaged in other ways. Chances are good that your hand would break before the knuckle-duster does. The guard of the original pattern guaranteed that the knife would still be in your hand if you were knocked unconscious. Don't expect comfort. The 9-inch-long fixed blade Black Sentry packs a 5-inch spear point blade with false upper edge. The hollow ground 420 high carbon stainless steel is blackened to eliminate reflection. That wears off quickly if the blade is honed, but even though the knife isn't of the best edge-holding steel, the limited use it will see should make the sharpness last and last. The Black Sentry Trench Knife comes with a friction-fit shoulder harness and sheath built for concealed carry. Alternate systems include belt loop and boot clip. 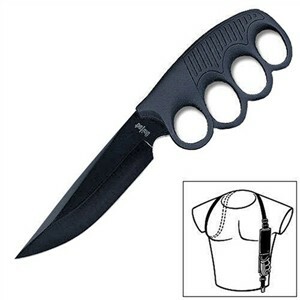 Check out the 1918 Knuckle Duster Trench Knife for something more reliable. It's the granddaddy of the Sentry and still considered one of the best combat knives ever made.